Am I The Only One Who Finds Such 'Jokes' Offensive? Home Culture My Story Am I The Only One Who Finds Such ‘Jokes’ Offensive? I often find ‘Jokes’ that are forwarded on Facebook, Whatsapp etc. offensive. Instead of making me laugh, like they are supposed to, they make me go red. 9 out of 10 times they will be making fun of women. Another married relative had expressed his enjoyment on this. What struck me here were both these men had an arranged marriage. Which means that they were not able to find ONE girl who was ready to marry them and had to rely on their parents. I mean seriously, had you been so surrounded by “Wine and Women” your mothers would not be calling strangers begging them the honor of letting their daughters serve you for life. Believe me it is because of your parents that you could get “Water and Wife”, other than that you would be sitting all alone, maybe with wine for company. 1. My wife sat down on a couch next to me as I was flipping channels. She asked “What’s on TV?”. I said “Dust”. And then the fight started. Do you not have hands and legs? Can’t you stop being a couch potato, pick up a cloth and wipe the damn TV. Why do you have to wait for your wife to do it? Is it not your house too? Why is house cleaning a work only restricted to women? 2. My wife was hinting about what she wanted for our upcoming anniversary. She said “I want something shiny that goes from 0 to 100 in about seconds.” I bought her a weighing scale and then the fight started. Why a woman needs to be slim for anybody? Why is a fat woman a ‘joke’? How many women care how much they weigh had the society not told them to care? How come there are no such jokes on fat men? 3. My wife and I were sitting at a table at her high school reunion. And my wife kept staring at a drunken man swinging his drink as he sat alone at a nearby table. I asked my wife if she knew him. “Yes” She sighed, “He is my old boyfriend. I understood he took to drinking right after we split, and has not stopped since”. “My God” I said to my wife “Who would think a person could celebrate for so long?” And then the fight started. If you were so fed up of your wife, why not divorce her and celebrate yourself? Wait, no you can’t do that, who will be your unpaid slave, then? 4. I asked my wife where she wanted to go for our anniversary. It warmed my heart to see her face melt in sweet apprehension. She said “Somewhere I have not been in a long time”, so I took her to the kitchen and then the fight started. 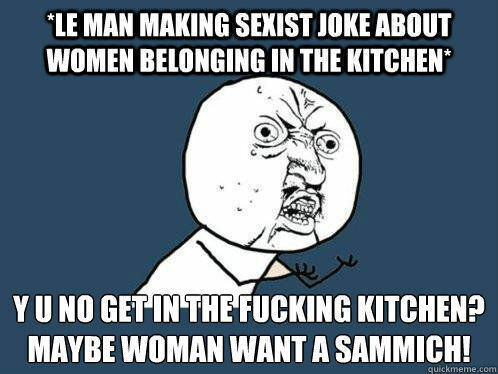 A woman’s place is in the kitchen, is it? I do not have words to describe how horribly sexist this is. Seriously, am I the only one not laughing?